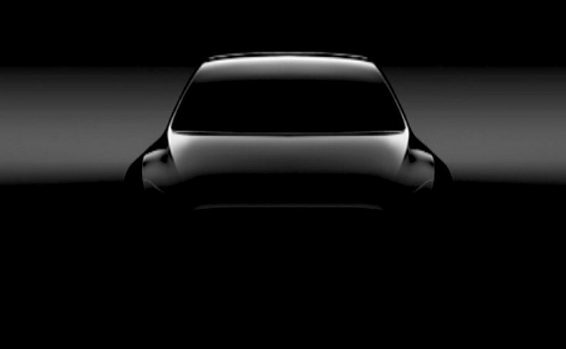 During the presentation of the results of Tesla, showed the first image of the first compact SUV from Tesla: the new Tesla Model Y.
Elon Musk is a clever, very clever guy and knew perfectly well that there was no better time to announce that they are developing a new car than in a call for shareholders where the press would be attentive to every word. Although Tesla is worth more than big brands like Ford, even Musk says it’s an unrealistic figure. During 2016 Tesla sold about 77,000 electric vehicles in the countries where it operates, a very low figure compared to other manufacturers. But it does not matter; it’s Tesla, the pretty girl in the car industry already hating the rest of competitors. After Model S that has revolutionized the sedan market, Model X has not seemed to make much noise, the new Model 3 is about to launch and the truck that have already started to show some companies interested in buying them, The Model Y compact SUV will arrive. The image that the company has shown of Model Y is surprising, because it is the first car that will not have mirrors. Cars with cameras to see traffic coming from behind there are many, including prototypes using screens and cameras such as mirrors, but none on sale because of limitations in legislation. Will Tesla be the company that makes these rules change? According to Tesla, they expect Model Y to be much more popular than Model 3, the car that has already managed to create a 2-year waiting list. It is known that Model Y has needed to design a new structure for Tesla and Panasonic batteries. That is, the chassis that the Model S and Model 3 cars share will not be compatible with this new vehicle. This new design will not require so much wiring by the car, which in the end will reduce the time of manufacture and its ultimate cost. Do not forget that apart from Model Y and the electric truck, Tesla is also preparing a pickup truck that is expected to show by the end of the year. At this rate, Elon Musk’s Tesla is becoming the brand to which all people want an electric vehicle.